Parrot Bebop-Pro 3D Modeling is the all-in-one drone solution for architects, building professionals and real estate agencies to easily create photorealistic 3D models, photos and videos of houses and buildings. This multi-purpose tool is a unique combination of the Parrot Bebop 2 and the Pix4Dmodel software solution allowing building professionals to easily and quickly assess the works to be done, draft new projects and promote their properties on the web. 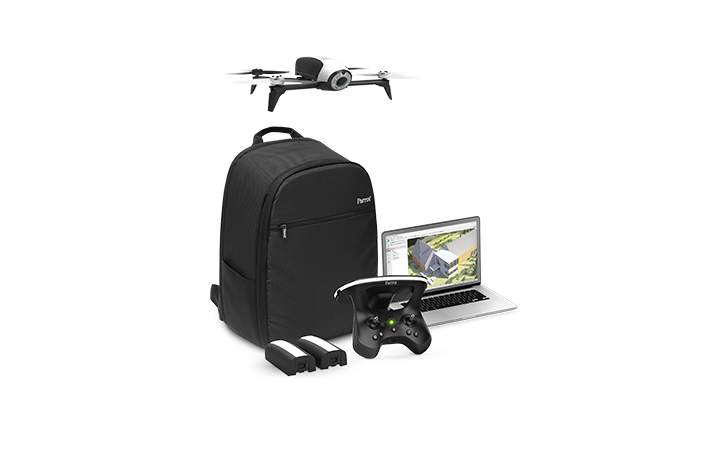 No need to be a seasoned pilot, the Parrot Bebop-Pro 3D modeling suits everyone, without prior knowledge of the drone or 3D modeling. The Pix4Dmodel software is one of the most comprehensive and powerful on the market, enabling you to obtain a 3D model with impressive rendering from the 14 MP photos taken by the drone. To make taking these photos easier, the Parrot Bebop 2 drone is programmed for an entirely automatic flight: simply use a smartphone and the Pix4Dcapture application. Light and compact (500g) the Parrot Bebop 2 is safe in flight, robust and easy to transport. Its 14MP camera ensures optimal shots and Full HD 1080p videos. All you need is a smartphone to control it and its 25-minute battery life in flight lets you get the job done without fear of not having enough battery during your flight. With the Pix4Dcapture mobile application, send the drone on assignment for a perfectly autonomous flight around a property or a construction site. The Parrot Bebop-Pro 3D Modeling is an easy to use solution for quick visual inspection and drafting structural works on a property or even landscaping. This tool can be used immediately to take your decisions with your design office or identify the works to be done. Get a building's measurements easily, such as the length, height or surface of a roof: before any works , you have available data to estimate the scope of the works to be planned, from painting walls to installing a new roof. A 3-dimensional model of a property is a new way to promote real estate. Much more effective than a video, the visitor takes control of discovering the property on his screen, by looking around the house wherever he likes, by viewing his environment from above, from up close and from all angles. Showcase a 3D model of a property on your website: let your visitors take control of the visit. With their screen, they can look around the house as they like, viewing its environment from above, up close and from all angles. The Pix4Dmodel solution incorporates several tools to make the 3D imagery experience of your property as comprehensive and easy as possible. With your Pix4Dcapture mobile application, plan your flights and retrieve all the images necessary for mapping. With the web publication module or directly from the application, send these images to Pix4Dmodel cloud, which automatically generates a 3D model from your images. You can then create a 3D model and a flight video of your project that you can view in any browser - it's really easy! Share this unique content on your site and your social networks to showcase your properties. With Pix4Dcapture, you can create a flight plan and retrieve a very comprehensive set of visual data. With this data, you have the possibility to create georeferenced maps or 3D models in Pix4Dmodel software (licence to be obtained). Pix4Dcapture places professional aerial mapping within everyone's reach. Parrot Bebop-Pro 3D Modeling is the all-in-one drone solution for architects, building professionals and real estate agencies to easily create photorealistic 3D models, photos and videos of houses and buildings.